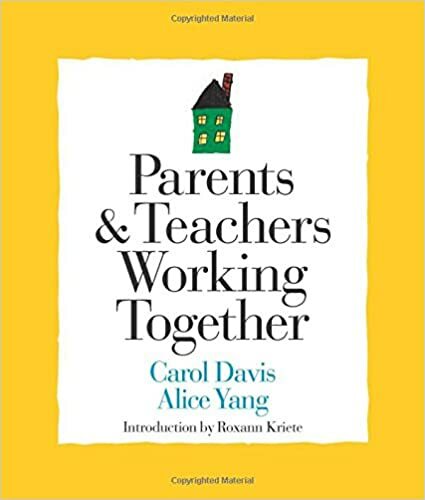 I finished book #2 of my summer reading challenge: Parents & Teachers Working Together. I tend to have fabulous relationships with my students' families, but I still learned a LOT about how I can make those already-fabulous relationships even more fabulous! Connecting with families can be really difficult. I consider myself lucky because my school does such a great job of taking on this task. We have an incredible PTA, an amazing staff, and so many interesting, meaningful events at school. However, not all teachers are as lucky to have so much of that connecting work done for them by their school. Some teachers have to do this all by themselves. Some teachers don't work in a welcoming school with staff that work hard to create a positive, supportive environment for families. Of course, even if you're in the best school, you still have to work to connect with families. Whether you're in my boat, or, sadly, you're in the other boat, I promise that this book is worth your time. You will get some great ideas that are easy to implement in your room. I'm going to write about the ones that I'm planning to use this year. I'm really excited! The first strategy I'll be using this year is writing a weekly newsletter. I have done this for years, but it has always taken me a lot of time. I draft up an email, re-word it a million times, check for typos, sometimes attach pictures... the whole enchilada! Honestly, since I want to be so thorough and give such a genuine snapshot of what happens in a day, this task ends up taking me an hour a week, easily. I know how important it is to communicate, but I knew there must be a better way to do this quickly. Well, there is. I am SO thanking the universe for pointing me in the direction of this book. Writing a newsletter won't take me longer than five minutes anymore, and if I want to give a really conservative estimate--ten minutes maximum! HOW!? How, you say!? I'll tell you how! I created a really easy-to-use classroom newsletter. You can get it by clicking the picture above. The link will take you right to my Teachers Pay Teachers store. 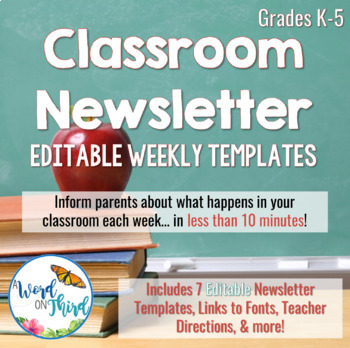 This cute, editable newsletter template is a wonderful tool to help you connect with your students’ families! Because you will be following a simple, bulleted list format to write about the bulk of the goings-on in your classroom, you will be saving yourself a lot of time. Additionally, this format keeps your newsletter simple and easy to read, which greatly increases the likelihood that families will read it. It's easy for a parent to forget about your 234098324-page-long email update. If you send it when they're busy (which is probably MOST of the time), they might intend to read it later but then never get around to it. I know I do that with a lot of my personal emails! Don't you? Most importantly, the “Ask Me About” section of the newsletter helps to create meaningful conversations about school within families. The bottom line is: you no longer have to spend hours writing up a fancy newsletter for your families! The "Ask Me About" section on the newsletter is my favorite. It is SUCH a brilliant idea. The bulleted list will include things you did during the week that parents should ask their kids about. Wait, it's that simple!? Yup, it's THAT. SIMPLE. You can decide on topics to include in the newsletter on your own or you can involve your students in the process. Involving students always makes any experience more significant for kids, so since the brainstorming session can easily be done in only a minute, why not involve them? It would be a great do-now question or activity to do while waiting for students to be dismissed at the end of the day. Jot their ideas onto a post-it note quickly and type it up later. You could even try to make it a shared writing experience and type directly into the PowerPoint document on your Smart board or projector. I recommend sending this newsletter home once per week on Fridays, but you can also send it home bi-weekly or even monthly. If you involve your class in generating content for the newsletter, you can easily ask them in a flash on Thursday afternoons. That way, plenty of the week will have gone by. You could always add something special on your own if you know you're doing it on a Friday too (for example, attending an assembly). 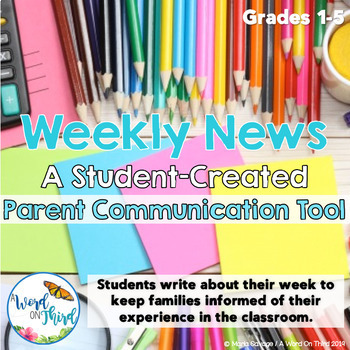 There's a section to include a picture, so you can include a photograph of your kids, student work, or anything relevant for that week. Just make sure not to break any school rules about taking pictures of your students. There's also a section to include any important reminders, which might range from field trip days, due dates, a change in the lunch schedule, conferences, etc. There's even a spot to put the date. All the work of making it pretty is done. You have minimal editing to do because you're using a bulleted list. And best of all, you have a more meaningful newsletter that really stimulates conversation! I LOVE IT! I am so glad I am going to be doing things this way now. Sometimes I would avoid sending emails home because I felt like I didn't have the time to deal with it. If you choose to download the newsletter template, all of the cute fonts and images will be on your screen (they don't need to be installed on your computer), and the text boxes are right there for you to start writing with right away. The next strategy I'll be using this year is sending home positive news. It is so easy to not contact families until we have a problem. The problem with that is that our relationship seems to start off on a negative tone. This can make families understandably defensive. I want to make sure to send home positive notes and emails and call home to share positive stories for my students regularly. Let's say the average class has 25 kids. If you can manage to notice 5 awesome things a day and contact home about it, you can contact each family in one week. Keep track of who you've been noticing so you can make sure everyone gets a positive contact home. This is so easy, and it involves minimal effort from you. You can even send home postcards! I thought that was a really personal touch that the students would love. I know if I had received a positive-news postcard as a kid, my mom would definitely have put it on our fridge and made a big deal about it. Adjust this system so it works for you. If you can do this two weeks a month, you will be a really caring teacher in most parents' eyes. If you can't deal with noticing five kids a day, can you notice two kids? All you need to do is keep track and make sure that everyone gets to experience the feeling of taking a positive note home. Another strategy I will use this year is a weekly exit pass. This one is easy, peasy! I also have a form I'll be using. It's a freebie on my Teachers Pay Teachers store. It's my Weekly Exit Pass For Self-Directed Learners. You can grab it by clicking on the picture below! Basically, I will be having the kids fill out this exit pass each week. This particular exit pass is a wonderful tool to help you connect with your students’ families, but it's still simple and easy for kids to use! I'm not using this to teach handwriting or writing--it's meant to get students thinking about their work and their choices over the past week. It will assist families in having worthwhile conversations about school. Even though this activity is very short, it helps students to become more self-directed because they set goals for themselves and reflect on choices they made that week that made them proud. This should take you no longer than a few minutes to complete each week. I recommend having students fill out the exit pass on Friday afternoons and bringing it to a closing circle to share with a partner at the end of the day. Then they can take it home to share with their families. Another plan I have is to start Wonderful Wednesdays. This will involve more planning, but I'm really excited to try it. Wonderful Wednesdays are an opportunity to invite parents into the classroom at any time during the day. They simply drop in and act as participants for as long or as short as they'd like to stay. Many trained Responsive Classroom teachers have this every Wednesday, but I will probably try for once every month or two until this feels comfortable for me. If you choose to try this, I suggest starting small so you can reflect and be successful. The trick is to invite parents in as participants, not presenters. I will be sending a schedule of our day home to parents prior to the Wednesday I choose so that they know what we'll be doing for the day. Parents can participate in whatever the day's schedule involves. For Reader's Workshop, I'll have them bring a book. For Writer's Workshop, I'll have them bring a notebook. During word study, they can play spelling games with the class. During math, they can work on the project we're working on. You get the point. The big thing here is that the parents aren't under pressure to perform--they are simply participating in the daily classroom routine alongside their child. They get to see what their kids are learning and experience our classroom culture first hand. I will not be starting Wonderful Wednesdays until my classroom community feels really strong. I will also not be inviting parents to specials (Can you imagine how annoying that might be for another teacher!?) or lunch. Of course, I'll make sure the day is OK with my administrator and check my school calendar too. The best part of this experience, though, is that parents can come in for part of the day whenever they want. They might come visit for 15 minutes during their lunch break, stop by for Morning Meeting before heading off to work, or something else they can manage to fit in. It's a great way to excite the kids about learning too. Those are the biggest things I am really hoping to get done this yea to really involve my students' families. Honesty, it's a lot to start doing in one year, so I am pumped to see what kind of positive changes I see these ideas making in my room. Do you like free stuff? Of course you do! That's why I'm giving away my newsletter template to a few readers who comment on the A Word On Third blog, Instagram, or Facebook community. That is ALL you have to do. Winners will be announced on Wednesday. So get commenting, Teachers!! What strategies do you use to connect with families? Comment below for a chance to win my newsletter template for free! That's all for now! I'm off to read my next book in my summer reading challenge.